Scientists and researchers designing and testing the classroom of the future that have found in the Star Trek movies. The ‘Star Track’ fantasy style of the future that’s going to change books or Whiteboards in the class. This is multi-user, multi-touch and can operate more than two students at a time in a class. It could give very positive impression on the student and they can improve fluency and flexibility in the studies. 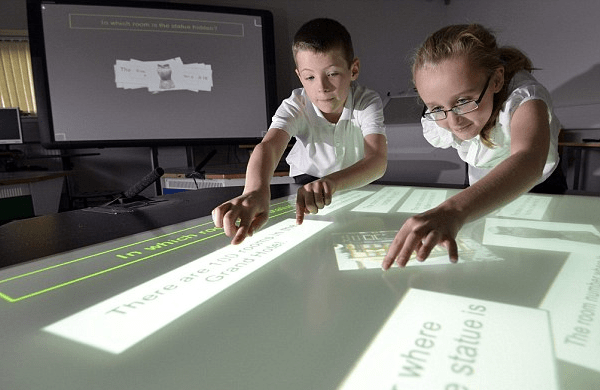 This electronic smart desk project ‘Star Trek Classroom’ is a trail version and have been tested by more than four hundred pupils. This smart desk is designed and software by Durham University and their studies show that they had very good impact on the pupil mathematics or that recognize multiple touches on the desktop using vision systems that see infrared light. According to the researcher, children will work together and solve problems using inventive solutions. The researcher Burd’s team found that 45 percent of students who used a math’s programmed on the smart desk increased the number of creative mathematical expressions, as other students who can work on paper-based style created 16 percent mathematical expressions. The classroom enables both active engagement and access and they found that the students are collaborating more efficiently. Such collaborations weren’t seen when the students used paper-based studies. With the help of this invention, students can able to work in groups as they can share their work with other desk and increase more interaction between students. Moreover, teachers can also able to study in a new fashion as the live feed of the smart desk goes directly to the teacher who can review them quickly and help the student while allowing the group work to continue. The students really enjoy doing mathematics in this next generation style and teachers are also given more attention or their interactions with the student improve significantly. In this way the collaborative learning to improve and students can learn more about maths. These desks are placed or built in furniture of the classroom in such a way that they are interconnected through networking and link to a smart board. We hope for the best and looking forward to hearing from this technological progress, as it can very helpful for the students in very beginning age or these types of practices that may also start in higher level mathematical studies for complex expressions. Previous PostIs technology for good or evil?